Content: There’s some violence, but nothing terribly graphic. What struck me is that there is a lot of exposition (with long words) in this one. I’m not sure if K understood everything that went on, but she got the gist of it. Which is what graphic novels are great at. It’s her 15th birthday, Cleopatra (yes, that Cleopatra) doesn’t want to go through with her party. The ceremony, the pomp, the everything. So, she sneaks away from her tutor, and discovers a portal to a future time and place that is being besieged by a tyrannical dictator. The prophecies declare that she will be the Savior of the world, but first: she has to go to academy to figure things out. It’s essentially a fish-out-of-water story; BCE girl meets futuristic technology. I liked how she found everything boring, until she got to combat training. She took to that immediately. She’s a girl of action, and she’s smart and tough — when it comes to combat. She’s not a scholar and that’s okay. The only thing that was a bit disconcerting was the whole talking cats. Cats in this world have evolved to the point where they kind of run things. And it’s a bit weird. But that just may be me. 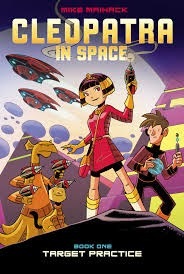 In the end, it reminded me a lot of Zita the Spacegirl — both in the content as well as the artistic style — which is a good thing. And I’m curious to see where Maihack goes next. Cleopatra through a time portal with talking cats, sounds humorous.